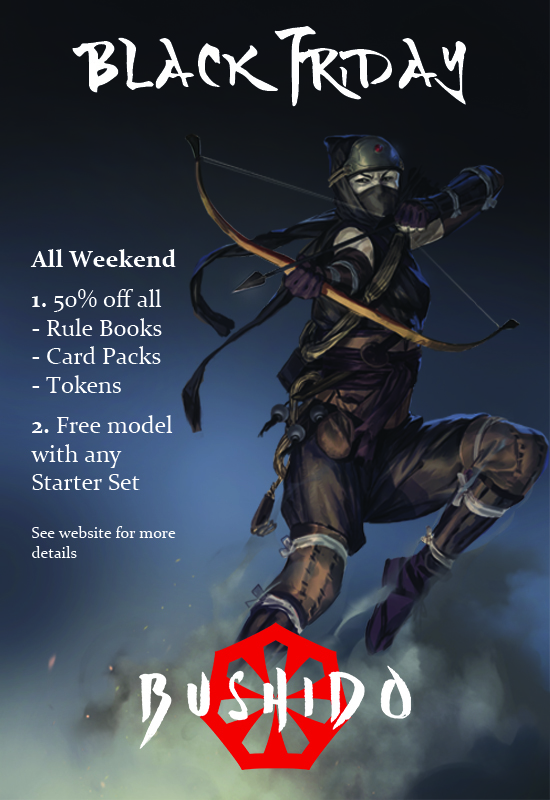 - Use the code BLKFRI to gain 50% off of all rulebooks, card packs and token sets. - Free model must be from the same faction as the one purchased. - Add the name of the model wanted to the comments section of your order. - One free model per starter set ordered. - Both deals can be used in the same order. - Deal lasts from Friday 23rd until Midnight on Sunday 25th of November. Grand prize will be the opportunity to collaborate on a Bushido model. Work with our team to craft the model you've always dreamed of for the Jwar Isles. Silvermoons will also be up for grabs along with other spot prizes given out on the day. It promises to be great fun and hopefully we'll see loads of you there. Amazing turnout so far, sold out in no time at all and some more and final tickets have been added! We've had some great entries and it's been fantastic so far to see how people are getting on with their models. Thank you for the entries and everyone that submits will receive confirmation, if you haven't received a confirmation contact us via the website. The competition will continue to run for the rest of November. We will be judging on painting quality, style and overall visual appeal of the images but we'd love to see a range of different abilities, to encourage novice painters we've also added the Luck of the Kami prize so one person will win a prize at random, got to be in it to win it and all that. An image of your tournament ready Bushido Warband, on terrain or not it's up to you. This can be any Bushido model or models you want. - A mamximum of four images per entrant. - All prizes will be provided in store credit to be redeemed on the GCT Studios Website. - Only Bushido models will be accepted. - Last entries will be accepted on 30th November. Good luck to all and I look forward to seeing your work!